I think Banana Republic really nailed it with this print. It's floral, but abstracted. In fact, it's almost cartoonish with it's bold outline of the bright cobalt leaves. Well, apparently I wasn't the only one in complete adoration of this print because it's now pretty much sold out in stores and online. I kept waiting and waiting to get the best sale price possible on the dress, but on Easter weekend when it went 40% off I pulled the trigger before it was gone for good. I am glad that I didn't listen to the reviews that said to size down in the dress. Yes, it has stretch, so if you size down it will work, but my normal size 4 fit like a glove. I also didn't understand why some of the reviews criticized the pockets. Even though I am not a very practical person, I am addicted to having pockets on skirts and dresses because they offer a great place to put your keys or phone. Now my only dilemma is that I want to get this print in the skirt, blouse and sweatshirt version that Banana Republic offers. I know it's redundant, but a good print can be rather addictive like that! Great Outfit! I love the beautiful colour combination. Thank you! I love blue and yellow together. It's one of my favorite combinations. Very nice look! Like the color combo, great shoes! Thank you! I am getting a lot of use out of these shoes, and I've only had them a week! You are the third girl in less than a week I have seen this gorgeous BR Dress on. I swear it looks the prettiest on you. 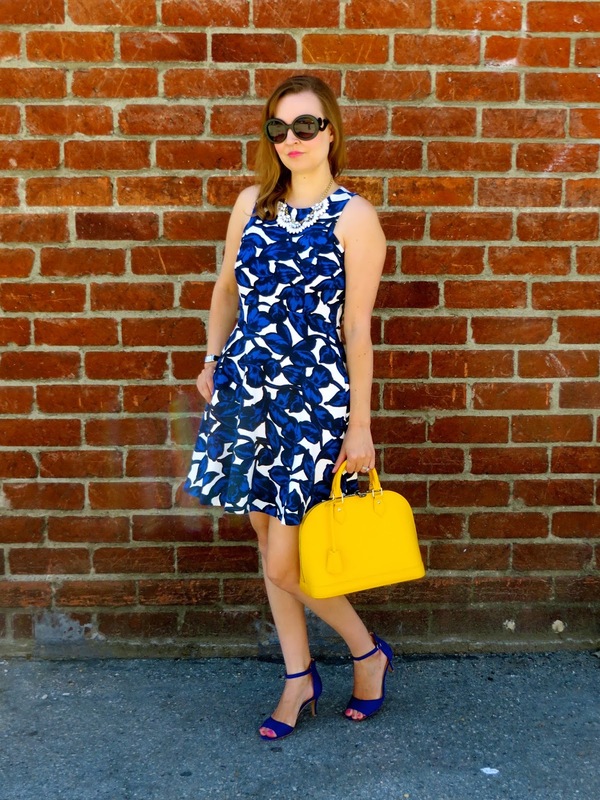 Love the perfect matchy cobalt stilettos. You look STUNNING, Katie! Aww...thanks Ada! 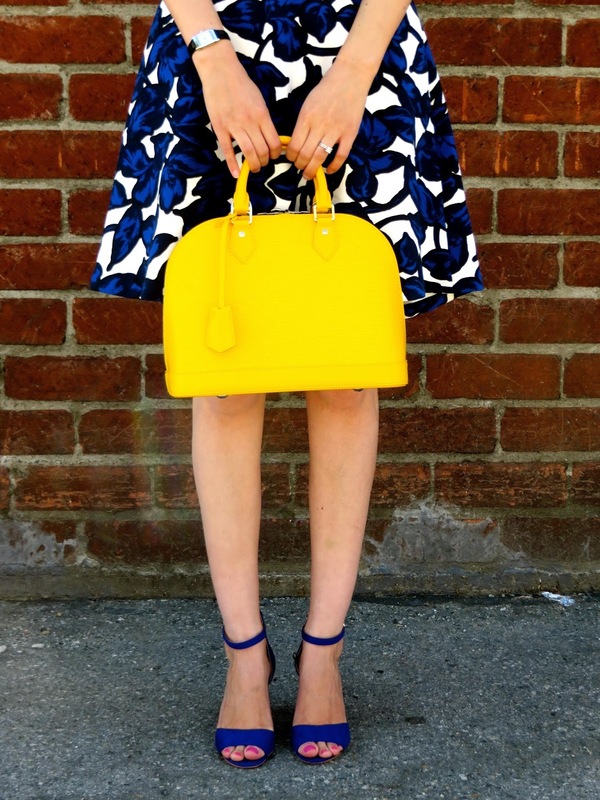 I have definitely seen this dress on a lot of bloggers too, which just proves how popular it is! Love this print, such a gorgeous shape on you too!!! Thanks Jess! I love fit and flare dresses, plus this one has stretch so it's super comfy! Thank you! The print and color of this dress are a great combo in my opinion. This dress is definitely going to become one of my favs! such a darling dress! 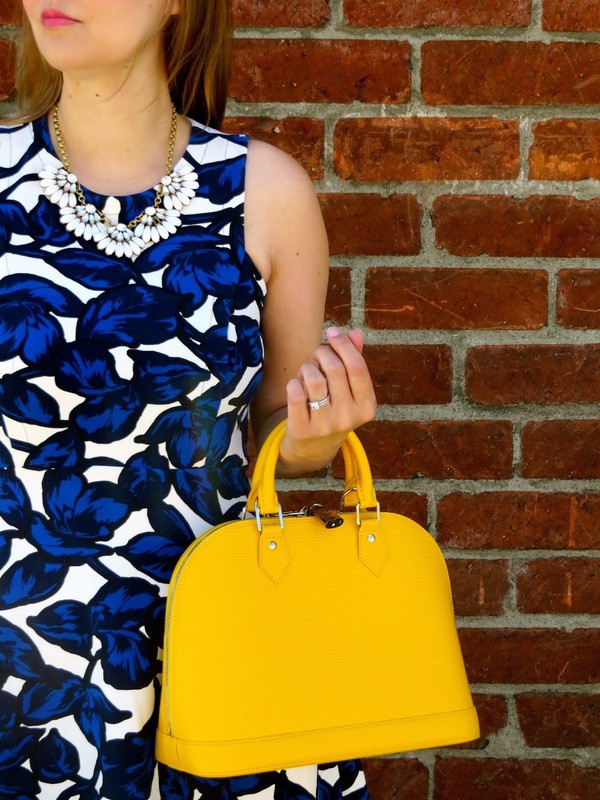 love how you paired it with the yellow handbag! super cute! Thanks Kelsey! I almost went with an orange bag, but maybe next time around! LOVE this dress and I love the fan necklace you paired it with - it dresses it up without distracting from what is (clearly) a really intense print! Yes, I wasn't sure what piece to pair the dress with, but I figured something neutral was best. Plus, the shape of the flowers echoes the print of the dress.